What Makes Suzuki Violin Book 2 So Special? In a word, EVERYTHING! In a more specific word, Tonalizations. 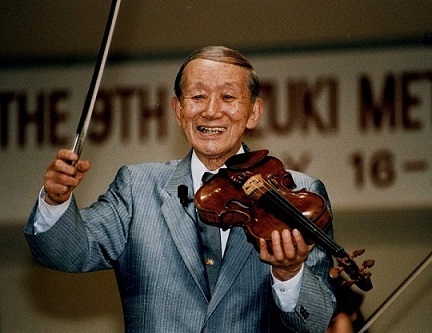 “Tonalizations” is a term coined by Dr. Suzuki (the wonderfully warm man in the picture). They are exercises intended to help students learn how to recognize beautiful sound, and how to consistently produce it. I love teaching Suzuki Violin Book 1 for the basic fact that I enjoy setting students up for success. I enjoy helping them to build the foundation of their violin playing upon which they will continue to build for the rest of their lives. But Suzuki Book 2, ahhhh… Suzuki Book 2 is special. All the elementary work is DONE. The foundation is laid. The posture is beautiful. The fingers know their places. The bow is under control. The tone is pure. The intonation is getting there. Now what? Now the fun begins. Suzuki Book 2 is where real violin playing can begin. It is all about developing beauty of tone as well as taming the beast of intonation. This is done using Suzuki’s unique concept called tonalizations. Although Suzuki Book 1 includes some tonalizations exercises, it is not until book 2 that we really get to the heart of what these wonderfully simple exercises are all about. The basic goal of tonalizations is to develop the concept of beautiful tone in the student’s ear. These exercises also affect our intonation by teaching us to pay attention to the ringy notes on our instruments. On the violin, the notes G, D, A, and E are ringy notes because they vibrate sympathetically with our open strings. (The note B is slightly ringy because it is a primary note in the overtone series, and it is a harmonic pitch on our E string) These notes will only ring if they are played perfectly in tune. Thus, when students learn to nail these five pitches, it greatly enhances their accuracy. In essence, ringy notes replace the finger tapes and become our new point of reference for all other notes, in any position! MENTAL: First, we must have a concept in our minds of what beautiful tone is. From Suzuki Book 1, I encourage (and require) students to listen to professional violinists play, and listening to their quality of sound. By internalizing this high quality, professional sound, it raises a student’s expectation of their own playing. If students are forever only exposed to the sound of other students, they will forever sound like students. But if they are exposed to some mind-blowingly beautiful violin playing, they will aspire to that higher level. PHYSICAL: Next, we must learn the little nuances and adjustments of both the left and right hand to unlock this beautiful tone in our own instruments. We also must learn to hone in on the sensation our bodies feel when we are producing our very best tone….the head vibrates, our jaw bone resonates, our backs feel as if an electrical current is passing through all the way down to our feet and back up again. INTELLECTUAL: Finally, our ears must learn to hear what we are playing in the moment, and we must be able to make adjustments as needed. Tone is an elusive beast, and I credit my teacher trainer, Ed Kreitman, for helping me to realize that beautiful tone begins at the beginning, and can really be developed in Book 2. With this in mind, I have created my latest online violin course, “Fabulous Violin Fundamentals: Suzuki Book 2”. This course really delves into some of the most difficult, abstract concepts of violin playing: difficult to learn and even more difficult to teach! Tonalizations are a common link in this long list of complex skills. Once a student has learned the art of tonalization and memorized the exercises, they can be applied in so many different ways, and always, the skill of beautiful tone production is present. After all, if we cannot produce beautiful tone, then what use is all the rest? Is this too much material? Only my students can tell me, and to my delight, they are saying “No! Bring it on! We get it!” Get the rest of the details about my online Suzuki Book 2 course right here.